This article is exclusive to Steemit, and is my own intellectual property. Wikileaks' motto states, "We Open Governments." 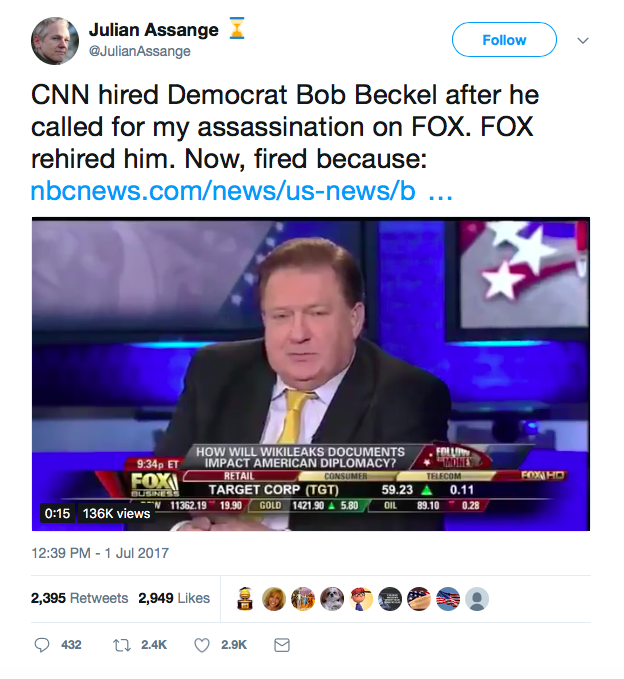 It should be no surprise that those who wish death on Assange are members, beneficiaries, and supporters of the same corrupt power structures that Wikileaks has so deftly exposed. The publisher's Editor-In-Chief are under continual attack, not for committing crimes, but for exposing the crimes of the powerful. For engaging in the most effective brand of journalism of the modern era, the publisher has been branded a hostile non-state intelligence service and compared to terrorist groups. 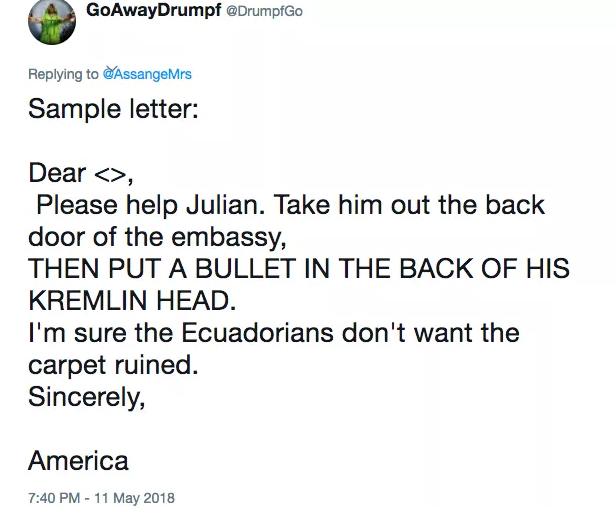 In late March, the Ecuadorian government under President Lenin Moreno cut off Julian Assange's communications with the outside world. However, silencing Assange hasn't satiated the blood-lust of the establishment. 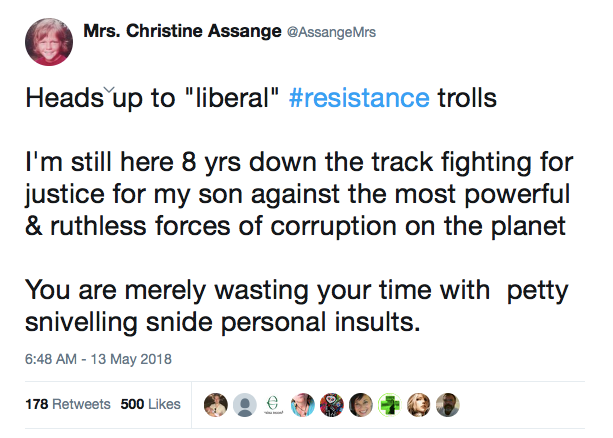 Christine Assange recently joined Twitter in order to more effectively advocate on behalf of her son after he was relegated to effective solitary confinement. 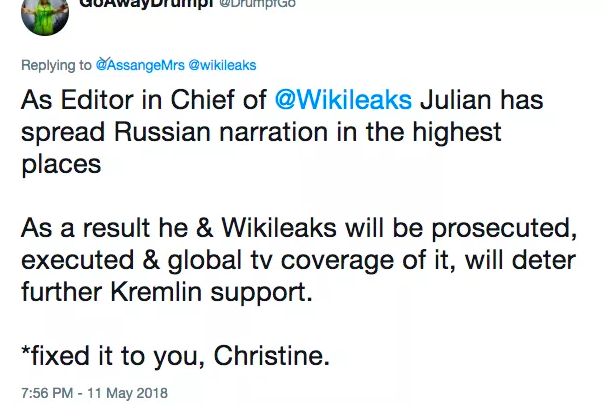 Shortly after Christine Twitter debut, a slew of anonymous and verified accounts harassed and mocked the mother of a politically imprisoned journalist. "Goode was the Senior Investigating Officer in the Metropolitan Police’s Counter-Terrorism Command (SO15). She also happens to be the one who was in charge of Scotland Yard’s investigation into Edward Snowden... During her time with the department, Goode used an anti-terrorism law to detain David Miranda, who at the time was the domestic partner of journalist Glenn Greenwald. The department held Miranda for nine hours and seized his electronic property." 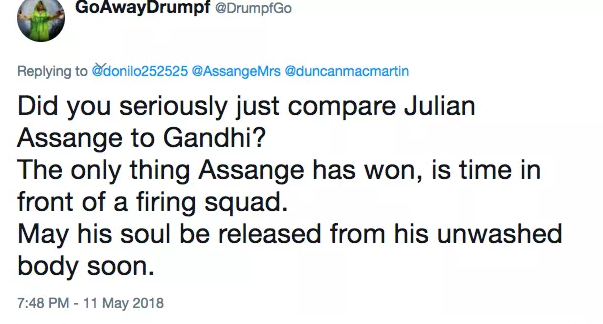 One anonymous user, using the Twitter handle "DrumfGo," left repeated abusive remarks in reply to Christine Assange, advocating for her son to be shot by a "firing squad," just days before Mother's day. Images of the abusive posts are available below. 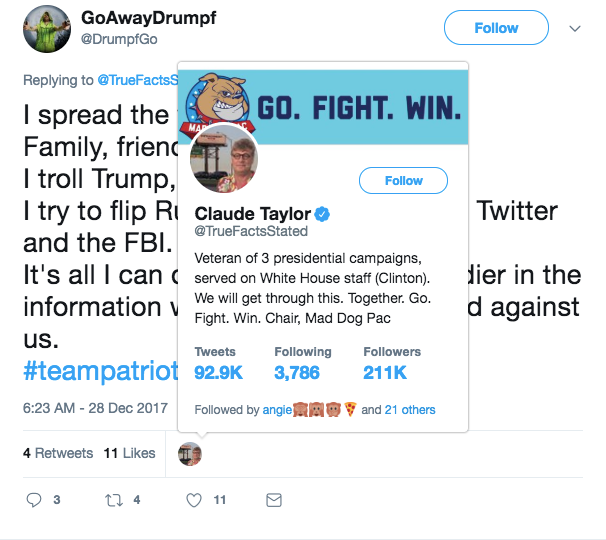 Although the account which Tweeted the invective is anonymous, a Tweet from the same user was 'liked' by the verified account of infamous political operative Claude Taylor. Taylor is a former member of Whitehouse staff during the Clinton administration. 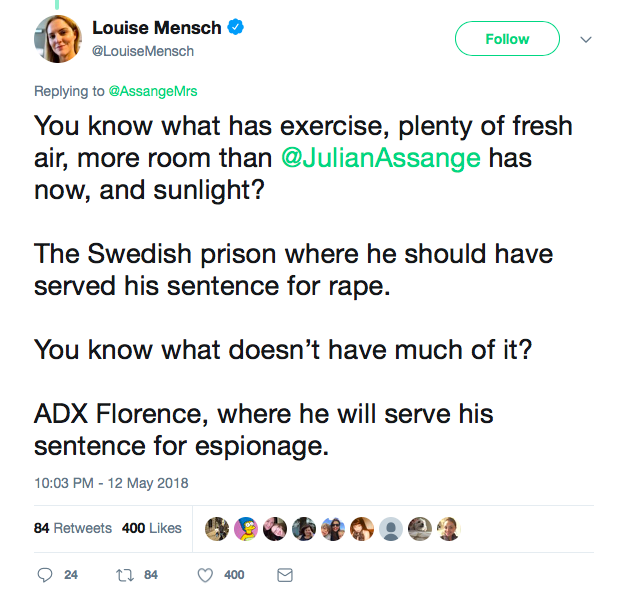 That members of the plutocratic elite and their media standard-bearers would call for the death of a persecuted journalist who has never been publicly charged much less convicted of any crime whatsoever is shocking. 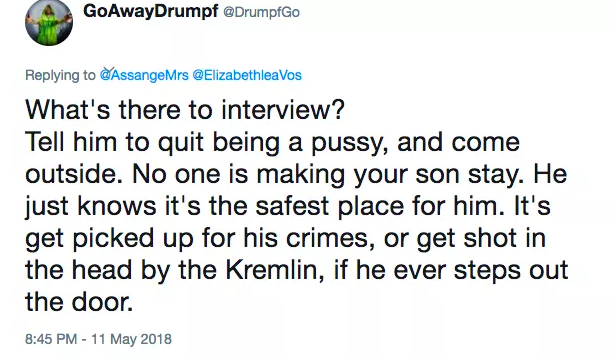 That members of that same establishment apparatus would further stoop to insulting that same journalist's mother at a time when he is unable to defend himself is indicative of the degree to which Julian Assange and Wikileaks have terrified the unelected power structure of the Western world. 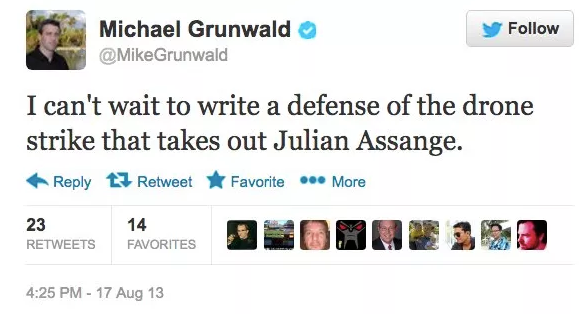 Individuals who had threatened Assange included: Col. Morris Davis, former Guantanamo Bay Chief Prosecutor and a regular legacy press commentator, Democratic pundit Bob Beckel, Reuters contributor Lori Grannis, and Michael Grunwald, a Senior staff writer at Politico, who was a national staff writer for The Washington Post and a ‘senior national correspondent’ for Time magazine. He had also authored a book on the Obama Presidency. "While the results of the evaluation are protected by doctor-patient confidentiality, it is our professional opinion that his continued confinement is dangerous physically and mentally to him, and a clear infringement of his human right to healthcare." This is incredibly compelling because the statements were made before the implementation of severe restrictions on Assange's communications with the outside world which were put into place in March. Wikileaks states that its publications have been cited by more than 28,000 academic papers and US Court filings. The ongoing effect the organization has had on the Western world, and on journalism, cannot be overstated. It is important to understand that those who spit venom at Wikileaks, Julian Assange and his mother on social media are almost exclusively members of the plutocratic ruling class. Sign the petition to end Julian Assange's solitary confinement and arbitrary, unlawful detention. Follow Christine Assange on Twitter to find out more about the many concrete actions you can take to help Julian Assange. HA, isn't it interesting that we have come full circle. The same counter-intelligence nefarious forces who accuse everyone of being a Russian bot, are now hiding behind anonymous twitter handles and making death threats and smearing anyone who opposes their agenda. I have a few choice words for these people, but will refrain from stooping to their gutter level idiocy. Great observation! Agreed on not wanting to stoop. I thought Christine's response was masterful in part because she totally went above their level. "It is important to understand that those who spit venom at Wikileaks, Julian Assange and his mother on social media are almost exclusively members of the plutocratic ruling class." ... not quite all. 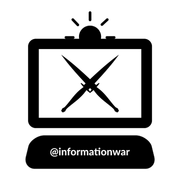 Some of them are basement dwellers belonging to the US and UK cyber commands (social media divisions), who didn't make the cut as drone pilots. But yeah, they are all cut from the same cloth. Major point of the article was that this is not a legitimate public sentiment, this is coming from the people Wikileaks exposes, their immediate friends, their sock puppet accounts, and then an incredibly small smattering of people who have been duped. Even those people - like the anon in the article - (assuming the anonymous account mentioned in the article is not a sock puppet act) - are usually liked/supported/RT'd by the same elite. Eg: that anon was "liked" by Claude Taylor, a Clinton operative, who is paired with Louise Mensch even by "liberal" media. Mensch also attacked Christine. So again the overall impression is that there is almost nil organic feeling behind these attacks. WikiLeaks and Julian Assange are woke on the JQ, and that is what makes them most dangerous to the (((Deep State))). Wikileaks called out the "Jewish" brackets on Twitter among other instances of "noticing". At this point, there is no shutting it down! The world sees Israel as the terror state it is, and recognizes it as the only nation in the ME who ilegally posseses nuclear weapons! The age of liberalism is coming to an end! Trolls are trolls. I don’t buy your argument that anyone who criticizes Assange or his Mum is a Plutocrat. She should be demanding proof of life. I signed the petition and donated early on. 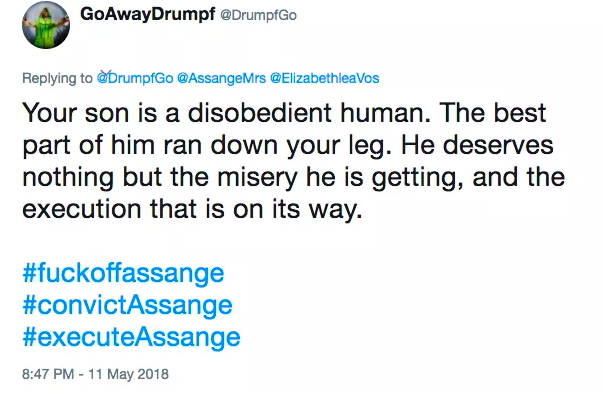 What is being done to (and said about) Mr Assange breaks my heart.